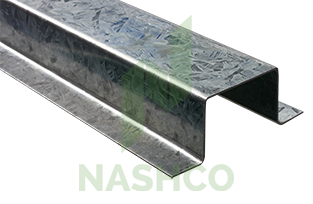 Backing strips are used to protect the substrate in an expressed joint facade system. 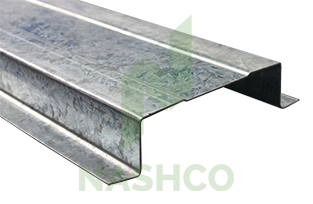 This is achieved by securing the backing strip to the framing at the location of the joint in the panel. The panel is then fixed over the top of the strip, whilst the strip bridges the 10mm gap between the panels. 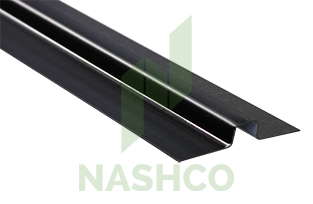 The 8.0mm Black Facade Backing Strip is used when a prominent black line is desired on the facade face. The backing strip can be fixed to the frame with construction adhesive or a flat framing screw. It is recommended to seal the backing strip to the Facade Panel in accordance with the Facade Panel specifications. The 8.0mm Black Facade Backing Strip is used with 9mm Fibre Cement systems as a horizontal joint between panels. Installed between the Facade Tophats and the Fibre Cement panel the 8.0mm Backing Strip gives a weather resistant and aesthetically pleasing finish. 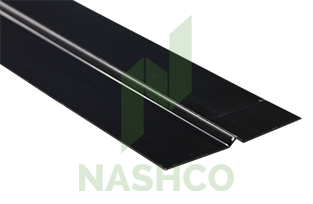 Manufactured from 0.48bmt colourbond steel the 8.0mm Black Facade Backing Strip is specifically for external use under harsh UV and extreme weather conditions. The 8.0mm Black Facade Backing Strip together with the 120x35mm Facade Top Hat and the 50x35mm Facade Top Hat make up Nashco System FS120, which is a framing system specifically designed for Fibre Cement Facade panels. This system provides a stable and consistent surface for the panels and creates architectural black shadow lines at each joint. An alternative to the 3.5mm Black Facade Backing Strip is the 8.0mm Black Facade Backing Strip which creates a black line at the face of a 9mm Panel.